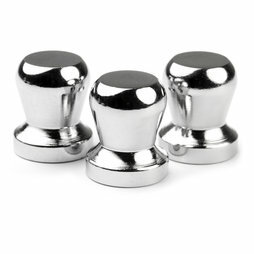 These magnets with a knob have an impressive 7 kg adhesive force, are easy to grasp and look very classy. Perfect for the office or as a practical and pretty gift. 10 pcs. 1.95 CHF ea. 1 pc. 12.00 CHF ea. 10 pcs. 1.85 CHF ea. 1 pc. 6.85 CHF ea. A single one of these magnets can hold up to 20 A4 sheets of paper on a whiteboard. Can your weakly ferrite fridge magnet do the same?